Tough as the holiday season was for many retailers, Wednesday’s fourth-quarter earnings report proves that few had it tougher than Target, which was bedeviled during the peak shopping season by one of the largest-ever retail data breaches. That breach cost the company $61 million in the fourth quarter, including $17 million in net expenses and a $44 million insurance receivable. That includes paying card networks to cover losses and expenses in reissuing cards, lawsuits, government investigations and enforcement proceedings. 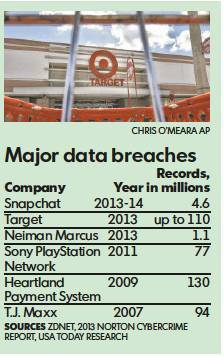 Target says it doesn’t yet have an estimate of the full cost of the breach. Avivah Litan, a security analyst at tech firm Gartner, puts the cost of the breach between $400 million and $450 million. The rest of the company’s fourth-quarter results tell a tale of woe: Net income fell 46% to $520 million, or 81 cents a share, from $961 million, or $1.47, a year earlier, the company reported. At the same time, the retailer said sales fell 5.3%, as customers were leery about shopping after the breach. Revenue at stores open at least a year fell 2.5%. Even then, there was some relief among investors that the news wasn’t even worse. Target shares closed at $60.49, up $3.98. The eyes of the nation’s retailers remain fixated on Target, recognizing that the potential for data breaches is hardly in the rearview mirror. Shortly after the breach, Target tried to lure holiday shoppers with a weekend of 10% discounts in December. It offered affected customers a year of free credit monitoring. Target executives were even called in to testify before Congress on the data breach earlier this year.